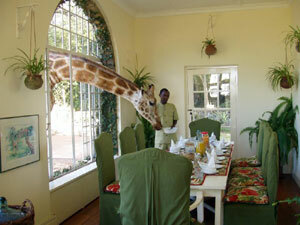 Giraffe Manor Hotel offers a pleasing mixture of traditional and modern elegance. With its two storey entrance hall, majestic staircase and immaculately furnished interiors, Giraffe Manor offers guests the unique chance to interact with the rare Rothschild GiraffeGiraffe Manor is set in 12 acres of private land within 140 acres of indigenous forest and is only 20 kilometres from Nairobi city centre. 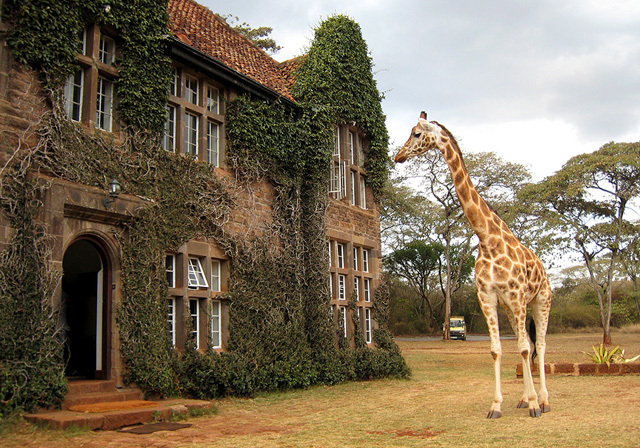 Built in the 1930s and modelled on a Scottish hunting lodge, this luxury boutique hotel has maintained all the charm of the era and is now famous for its resident herd of Rothschild Giraffe. 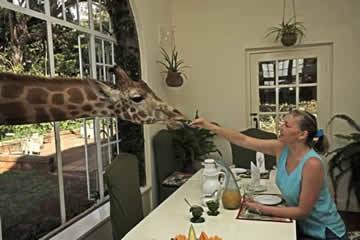 Giraffe Manor offers you an unparalleled experience of the giraffes, with them vying for your attention at the breakfast table, the front door and even your bedroom window. Airport transfer from Nairobi Jomo Kenyatta International airport or Wilson airport to Giraffe Manor Hotel or trasfer from Giraffe Manor Hotel to Nairobi Jomo Kenyatta International airport or Wilson airport.